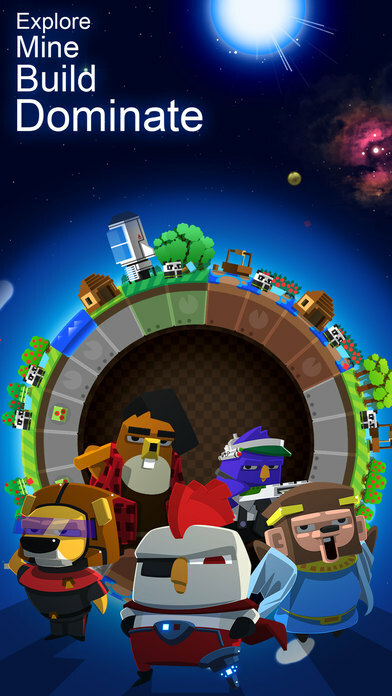 A Planet of Mine for Android/iOS (iPhone/iPad). A Planet of Mine Tip #1: Planet Tips. War is a combat phase between planets. When a planet lose 10 life points a spot is replaced by volcanic biome. Associated structure is destroyed and the workers do a death test. If the life point of a planet reach 0 then it explode. An IA can abandon a planet. Quantity of resources given to each natural plant at the end of a planet cycle. You can upgrade regenerative power with a plant nursery. A positive pollution level decrease regenerative power. 20 seconds cycle. At the end your population eat redballs and produce ascension. The planet also regenerate natural plants. Some planet are so extreme they have lost their atmosphere and are called dead. You can still have inhabitant on this ones, but without the survival helmet discovery your productivity is down by 50%. Some structures can't be built on these planets. Dead planets can't have cultivable grounds. A Planet of Mine Tip #2: Resources Tips. To produce or gather resources, a structure needs a worker. Productivity depends on the species of the worker and the biome. Add more workers increase the number of resources produced or gathered. Species have preferred resources they can also increase productivity. Some structures needs energy to work properly. This energy is provided by powerplants. In the case your planet lacks energy, all energetic dependent structures are shut down. Energetic productivity discovery increase disposable energy without the need to build new powerplants. You can gather a lot of energy from wind with a wind powerplant. There is no wind on dead planets. A cultivable soil can growth plants and you can also build farms and plant nursery on it. A dead planet can't have any cultivable ground. A Planet of Mine Tip #3: Structure Tips. To build or upgrade a structure you will need an inhabitant on your planet. If you which to build an already upgraded structure it will cost the same as all the resources needed for each upgrade. Some structures can change their transformation recipe. You can do it by selecting the structure. Upgrading these structure unlocks new recipes. choosing a structure and dragging an animal to finish the construction. A Planet of Mine Tip #4: Species Tips. Number of inhabitant on your planet. To increase population on a planet you need to build habitations. Habitat optimization discovery increase places without the need to build new habitations. On a given planet, you only need one inhabitant of a species to be able to request new ones of this species with ascension. Fight against Pinatosaurus, volcanic biome, radioactive containers and war are dangerous for inhabitants. In this cases you'll see a blink meaning they are under a death test. If they failed that test they die. Resistance discovery increase your ability to succeed at the test. Some structures emit pollution in the air. Each planet has its own absorption capacity of pollution. Each sea and forest count for 1 absorption point. When pollution is over 0, the regenerative power of your planet is affected. Over 5 ascension's production by inhabitant is affected. You can reduce pollution with filters. Dead planets can not be polluted.